Without a doubt, Woody Herman was one of the most talented bandleaders of the twentieth century. With numerous hits and an ear for staying contemporary, he remained active and vital long after most of his contemporaries had hung up their batons. Herman began in show business at an early age, singing and dancing in vaudeville at age six. He later studied the saxophone and clarinet and worked with Myron Stewart and Joe Lichter before joining Tom Gerun’s band in 1929 as both an instrumentalist and a singer. He remained with Gerun until 1934 then briefly worked with Harry Sosnik and Gus Arnheim before being hired by Isham Jones. When Jones retired in 1936 due to illness, many of his musicians opted to stay together. They formed a cooperative unit and elected Herman as president and leader. 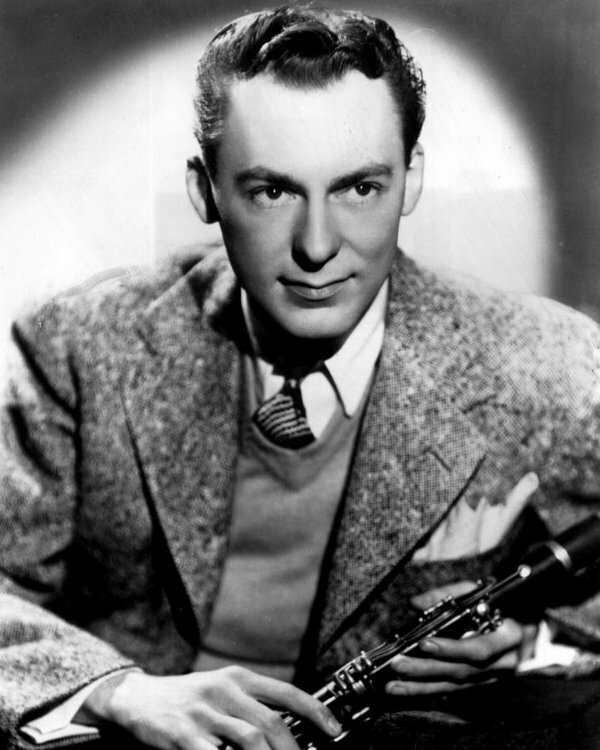 The early Woody Herman Orchestra focused mainly on blues arrangements, giving itself the moniker “The Band That Plays the Blues.” The group struggled at first to gain acceptance. Recognition finally came in 1939 with their first big hit, “Woodchopper’s Ball,” on Decca Records. In 1943, the orchestra was renamed Woody Herman and his Herd. Its style by that time had shifted away from the blues. Heavily influenced by Duke Ellington, the orchestra’s music combined bop themes and swing arrangements, much to the critics’ delight. The band even attracted the attention of classical composer Igor Stravinsky, who became a big fan. Stravinsky wrote a special number, “Ebony Concerto,” for the group to perform at Carnegie Hall. Vocalists over the years included Sharri Kaye, Dillagene, Carolyn Grey, Mary Ann McCall, Carol Kaye, Muriel Lane, Kathleen Lane, Jean Bowes, Sue Mitchell, Lynne Stevens, Anita O’Day, and Frances Wayne, as well as Herman himself. Musicians included trumpet players Neal Hefti, Pete Candoli, and Sonny Berman, drummer Davey Tough, bassist Chubby Jackson, pianist Ralph Burns, tenor saxophonist Flip Phillips, and vibraphonist Red Norvo. Herman also broke conventions and hired two female musicians, trumpet player/vocalist Billie Rogers and vibraphonist Marjorie Hyams. By the end of the war years, Herman’s orchestra was the most popular in the nation, winning both the Metronome and Downbeat polls in 1945. With the band’s success, though, came increasing pressure on Herman, and in December of 1946 he made the surprise announcement that he was disbanding the group in order to devote more time to his family. Herman, however, found it difficult to stay away from the music business. After a stint as a disc jockey and a few sessions with pick-up bands, he finally formed a new group, the Second Herd, in 1947. The new band featured a “cooler” sound, with such musicians as Stan Getz, Zoot Sims, Clark Terry, and Oscar Pettiford. The orchestra remained together only two years and had its biggest hit with the tune “Four Brothers.” During the 1950s, Herman formed a Third Herd, which scored a hit with “Early Autumn,” and later he organized the New Thundering Herd. Sadly, Herman’s life ended on a sour note. After financial problems in the 1960s, caused by an inept band manager, Herman ended up owing back taxes. He was forced to continue performing during the 1980s in an effort to pay off his debt. Illness finally prevented him from touring and the IRS seized his assets, including his house. He died soon after, in 1987, from complications of pneumonia.